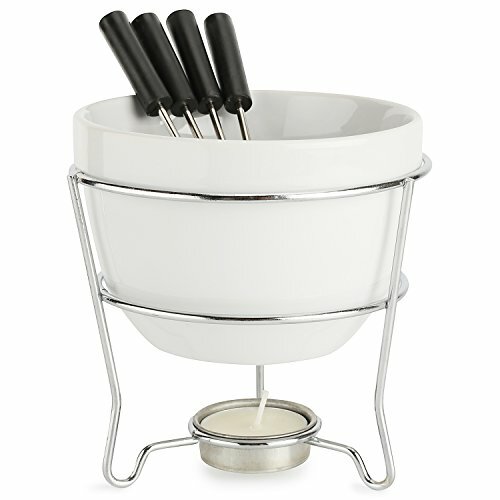 b>Make everlasting memories, with your kids, family, friends and loved ones - all you need is this food fondue set! Sharing a meal is one the best ways to build those long-lasting relationships and emotional connections with people you love. Bonding over a shared bowl of chocolate or cheese will be messy, yummy and full of laughter. The perfect indulgent treat for camping out this summer or a cold evening inside in the winter! ✔️ Smart and Sophisticated - Made with white ceramic and stainless steel. The modern design will look stylish in your kitchen, dining room or on a buffet table. ✔️ Everything You Need - The set includes the complete set for a fondue evening. (4)four serving forks, a ceramic fondue pot, warming stand with an attached tea light candle holder. ✔️ Holds Large Amounts - This fondue bowl holds 160z and measure 5 x 3 x 5 inches. It can hold a good amount of chocolate, cheese, seafood, or meat fondue. or as a tableside warmer for mouthwatering sauces, gravy or melted butter. ✔️ Suitable For: You can use the melting pot for any type of chocolate, cheese, broth or tapas, it's evenly heated by a candle.  Easy to Wash - The ceramic bowl is dishwasher safe, and it can also go in the microwave and oven. There is nothing like an intimate, candlelit dinner for two complete with a magical fondue set. You and your partner can have fun preparing the cheese sauce, meat or chocolate delights and sitting down to indulge in your tasty treats. No one can resist a pot of molten chocolate or cheese, can they?Get it Today and see for yourself how your guest will answer that!  EVEN HEAT DISTRIBUTION WARMING POT - We recommend heating your white, milk or dark chocolate, or cheese sauce on the stove first. Transfer your mixture into the porcelain fondue bowl and light the tea light candle underneath. The even heat distribution keeps the chocolate or cheese at the perfect temperature for dipping!  PERFECT NOVELTY GIFT FOR CHOCOLATE AND CHEESE LOVERS - What do you buy for someone who is a chocoholic or cheese lover? Simple, this cheese, chocolate fondue melting kit of course. When you know a special someone, who can't seem to get enough cheese, or chocolate this is the ultimate gift for them - dishwasher, microwave and oven safe.  USE FOR MULTIPLE APPLICATIONS AT MULTIPLE OCCASIONS - If you are hosting guests this fondue kit is perfect for tableside service, buffets, and party tables. Whether it's a dinner party, birthday party, bridal shower or anniversary, these fondue set will be your go to for presenting any types of food servings, Add fruits, munchies, candies, etc. for Desserts, or appetizers.  THE BEST CHOCOLATE AND CHEESE FONDUE SET - Reminiscent of sleepovers, winter ski trips, camping, and dinners spent with the best of friends a chocolate fondue pot is the perfect indulgent comfort treat. Just imagine all the delicious dipping treats you can try, from strawberries to mango, to marshmallows and mini cupcakes. If you have any questions about this product by home ess., contact us by completing and submitting the form below. If you are looking for a specif part number, please include it with your message.